Book Launch Update – Thank you!! I wanted to update you all after completing the first wave of publicity and promotion of the book release. When I decided to publish this book my hope was that I would be able to use our story to connect with people in a positive way. So far the response has been beyond anything I could have hoped for. 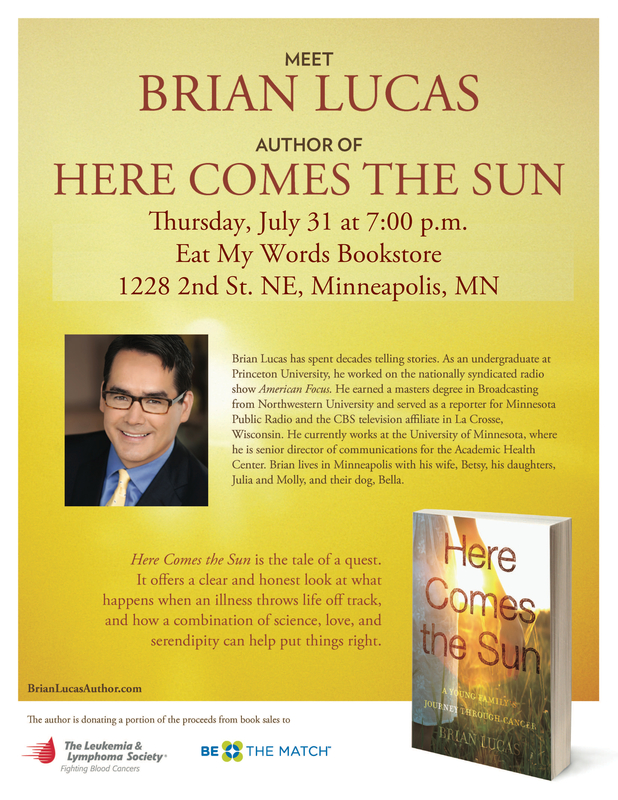 Through four launch events… another three bookstore events (thank you Birchbark Books, The Bookcase, and Common Good Books)… and media coverage from Fox 9, KARE-11, WCCO radio, the Star Tribune and Pioneer Press… the last couple of weeks have been incredible. Your enthusiasm for the book and your kind words have been overwhelming. Special thanks to the two organizations that I am supporting with this book. The Leukemia & Lymphoma Society and Be The Match have been enthusiastic supporters. I’m proud to be associated with them. With the initial launch behind us, we’re now turning our attention to the next phase of promotion. On Saturday in Minneapolis there is a conference bringing together all of the bone marrow transplant centers from around the country. Be The Match has offered me a table to sell and promote the book, so that will be an exciting day. I’m starting outreach to some more bookstores to schedule events… so if you have ideas for me please send them along. We’re also starting to talk about visiting other cities to promote the book. We’ll have to plan these visits out well in advance and space them out over time… but we really want to get to other markets so please send me your ideas for cities and bookstores in those cities so we can develop a plan. Finally… we need all of you to continue to serve as our ambassadors… as our word of mouth team. Consider writing a customer review on Amazon.com (and Goodreads… and any other book site). These reviews are critical in helping people discover the book, so the more I can get posted the better! You are a key part of our team in helping this book find an audience. Thanks for all you’ve done so far! I’ll post more as we schedule the next round of events. Kindle Version is now available! 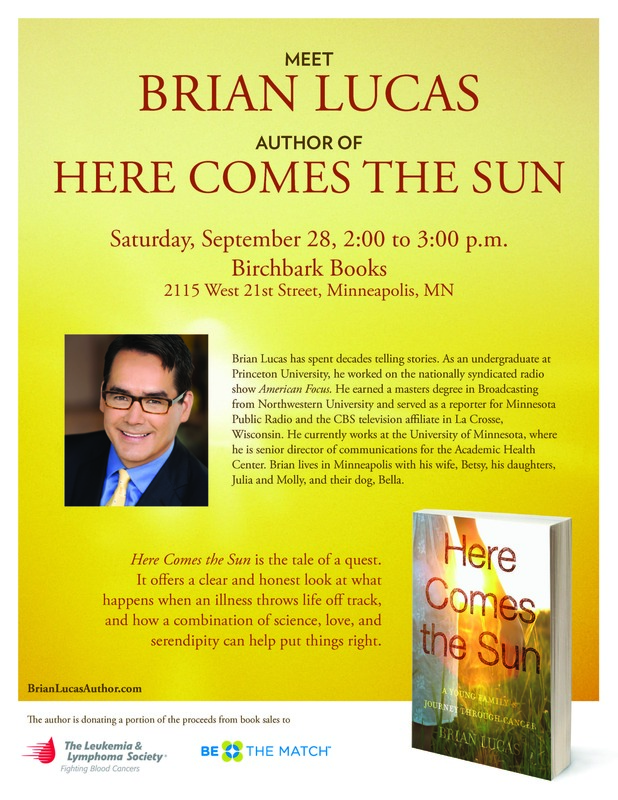 If you’ve been waiting to get the e-book version of Here Comes the Sun, it’s now available! Also… please remember to review the book on Amazon and any other sites once you read it. (Goodreads.com… barnesandnoble.com…) It really helps the book find an audience!